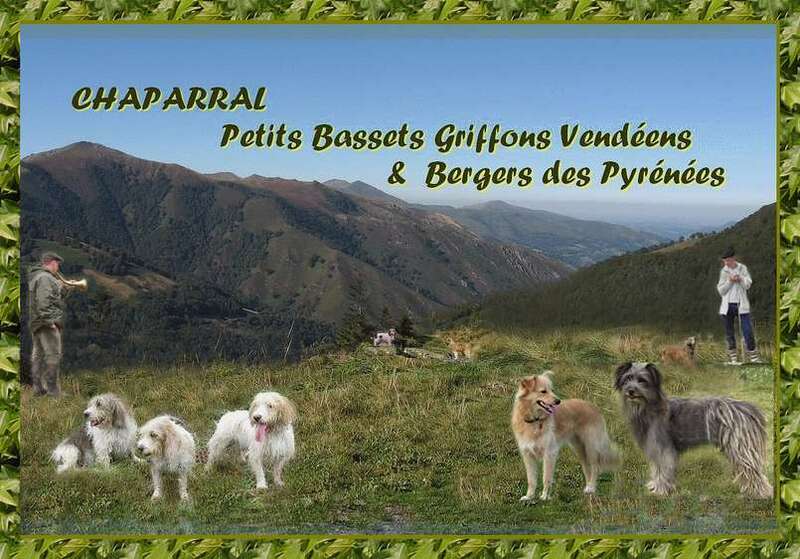 is the premier breeder of Bergers des Pyrénées in Canada, since 1995 and designated "Hall of Fame Breeder" by the Pyrenean Shepherd Club of America. 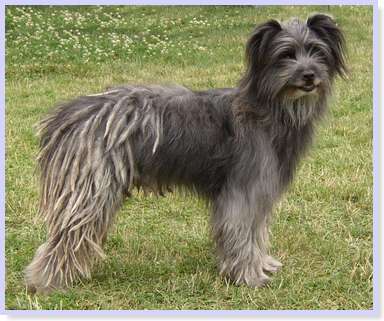 Also known as the Pyrenean Shepherd, or Pyr Shep, this breed will continually amaze you with their zest for life and family devotion. Intelligent, dynamic and energetic these little dogs are smaller than a Border Collie. 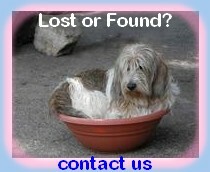 They have a very strong character and are always happiest when doing a job for you, big or small. Valued as tireless working farm dogs their desire to please, versatility and agility also makes them well suited and very popular as a competitor in all types of performance events such as agility, disc dog, flyball and the like. Coupled with a hardy constitution it is my pleasure to share with others the enjoyment my family experiences living with this unique breed. 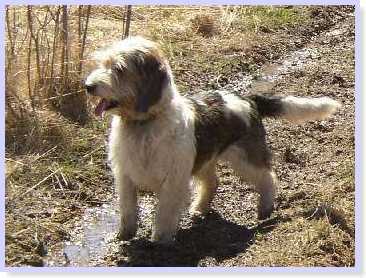 The Pyr Shep ranges in size from 38-48 cm (15"-19") tall at the shoulder, weighing 8-13 kilos (18-30 lbs.) which is an ideal size suited for any lifestyle. 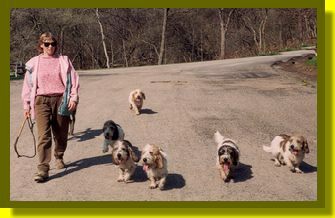 is the longest standing breeder of Petits BassetsGriffons Vendéens in North America, since 1985. Also known as PBGVs these marvelous little French rabbit hounds have a zealous and happy-go-lucky nature which makes them a constant source of amusement and a delight to own as a family pet, hunting companion, for competing in the show ring, obedience ring or even agility.First and foremost, my breeding program is dedicated to preserving and utilizing the inherent working qualities which secures the best of character, most biddable nature and outstanding temperament for breeding. 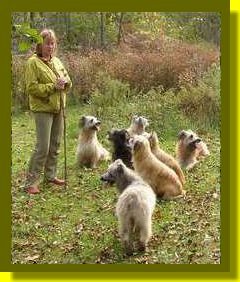 These qualities combined with their beauty and original rusticity gives me great pleasure and confidence in promoting this breed to everyone who visits and would like to learn more about the breed. The PBGV ranges in size from 38-43 cm (15-17") tall at the shoulder, weighing 11-13 kilo (25-30 lbs) which is an ideal size suited for any lifestyle. and see what products and services we have to offer. Code of Ethics and Code of Practice. 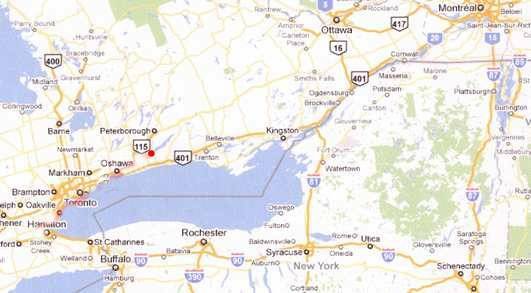 Surrounding our home in the eastern townships you can experience the historic setting of Port Hope on Lake Ontario which boasts the largest number of Heritage Properties in Ontario; the rolling hills and vistas of Northumberland County; the local Native history around Rice Lake; the beautiful and quaint Prince Edward County known for the local artisans, cheese and wine making; and in the Peterborough/Kawarthas area there is the famous Peterborough or Kawartha Farmers' Market and Lift Locks (part of the Rideau Canal). Around the corner from our home is the 4th Line Theatre which is an outdoor live theatre in Millbrook which is an exceptional experience on a warm summer evening; or go exploring in the Ganaraska Region Conservation Authority forest which abuts our property supporting miles and miles of trails for hiking and horseback riding or spend and exciting few hours exploring the canopy of the forest going Treetop Trekking. 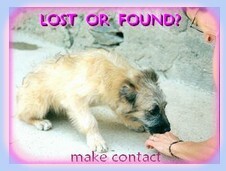 We just want to help you and the dog towards a contented life. © Copyright 1998 . All contents of this web page are protected by copyright laws. Unauthorized reproduction and distribution is prohibited.